The words come as the EU suspends new sanctions – including visa bans and asset freezes – to give peace efforts a chance. Vladimir Putin will not be spoken to in the language of ultimatums, a Russian radio station has quoted the Kremlin as saying. Reports suggest German Chancellor Angela Merkel had given him until Wednesday to agree a peace plan over Ukraine or face new sanctions. The warning came as Mrs Merkel met US President Barack Obama to discuss the peace initiative, while the White House considers supplying weapons to Kiev. The leaders of Ukraine, Germany, France and Russia are preparing for a summit in the Belarussian capital of Minsk on Wednesday, aiming to end the 10-month conflict, which has killed more than 5,000 people. 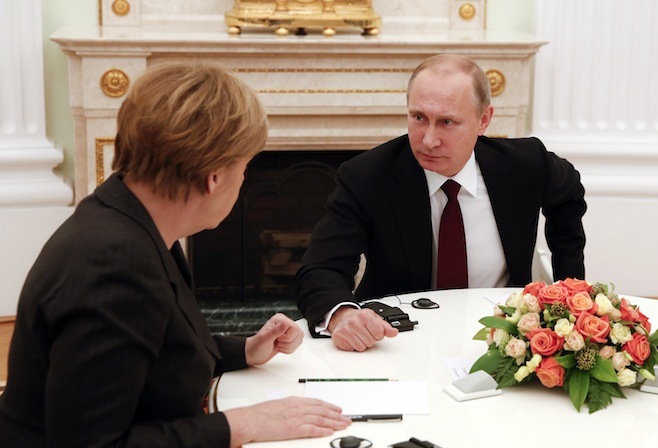 Mr Putin hosted Mrs Merkel and the French leader Francois Hollande for talks in the Kremlin on Friday and the Wall Street Journal had reported that Mrs Merkel had given Mr Putin until Wednesday to agree to a Franco-German peace plan. Meanwhile, the European Union has approved new visa bans and asset freezes on more Ukrainian separatists and Russians but has suspended the new sanctions until 16 February to give peace talks a chance, according to French Foreign Minister Laurent Fabius.